The converter can buck or boost as the input voltage changes. The circuit topology provides inherent short-circuit protection due to the use of a coupling capacitor. In many applications, the input voltage can vary above and below the regulated output voltage. A standard boost converter cannot be used when the output voltage is below the input voltage. In this case, the MCP1650/51/52/53 can be used as a SEPIC controller. A SEPIC requires two inductors or a single coupled inductor, in addition to an AC coupling capacitor. As with the previous boost-converter applications, the SEPIC converter can be used in either a bootstrap or non-bootstrap configuration. The SEPIC converter can be a very popular topology for driving high-power LEDs. For many LEDs, the forward voltage drop is approximately 3.6 V, which is between the maximum and minimum voltage range of a single-cell Li-Ion battery, as well as three alkaline or nickel metal hydride batteries. The figure below shows an example of a battery operated LED Driver using MCP1650 SEPIC Converter topology. 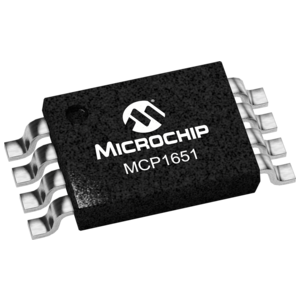 This board demonstrates MCP1650 boost controller in a low power application that requires a regulated output voltage from an input source that can be greater than, less than, or equal to the output voltage. The demo board generates a 5.0 V output from a 3.0 V to 7.0 V source.